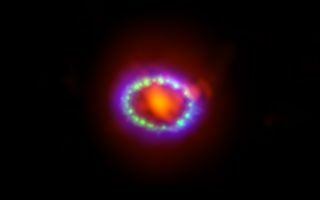 This space wallpaper shows the remnant of Supernova 1987A seen in light of very different wavelengths. This space wallpaper shows the remnant of Supernova 1987A seen in light of very different wavelengths. ALMA data (in red) shows newly formed dust in the center of the remnant. Hubble (in green) and Chandra (in blue) data show where the expanding shock wave is colliding with a ring of material around the supernova. This ring was initially lit up by the ultraviolet flash from the original explosion, but over the past few years the ring material has brightened considerably as it collides with the expanding shockwave.